The 14th Paralympic Games was close to the end on September 7. In the past 9 days the Chinese delegation to the Paralympics kept winning medals with an overwhelming momentum. This set a difficult question to Chinese Ambassador Liu Xiaoming. Tonight he will host a victory party for the Chinese delegation to the Paralympics at the Chinese Embassy together with Madame Hu Pinghua. He has to keep up with the athletes’ paces of getting victory when declaring the number of gold medals. Sure enough, within the half an hour from the Embassy opened the door to welcome the delegation to the delegation arrived, total number of gold medals of the Chinese delegation rose from 73 to 75. At about 7 p.m., led by Delegation Head Wang Xinxian and deputy Head Feiyong, the leaders, athletes, coaches and members of the Chinese delegation to the Paralympic Games arrived at the lobby of the Embassy. Every one of them was full of vitality, self-confidence and happiness. There were many big names among them, for example Zhang Cuiping, gold medalist in women's rifle and air rifle shooting and the first gold medalist in the Paralympic Games, Li Jianfei, gold medalist in mixed pistol shooting, Dong Chao, gold medalist in men's air rifle shooting, Liu Lei, gold medalist in men’s 67.5 kg class weightlifting, Liu Fuliang, gold medalist in men's long jump and triple jump, Zhou Guohua, gold medalist in women's 100-meter sprint, Pan Shiyun, gold medalist in men's 100m freestyle and 50m butterfly swimming, Zeng Sini, gold medalist in women’s bicycle road racing and track cycling, Liang Guihua, gold medalist in men’s track cycling and Guangcheng, gold medalist in men’s one person dinghy. To greet the heroes in the Paralympic Games and celebrate their excellent performance, Ambassador Liu, Madame Hu and others at the Embassy made careful preparations. They presented a spectacular party before the dinner. 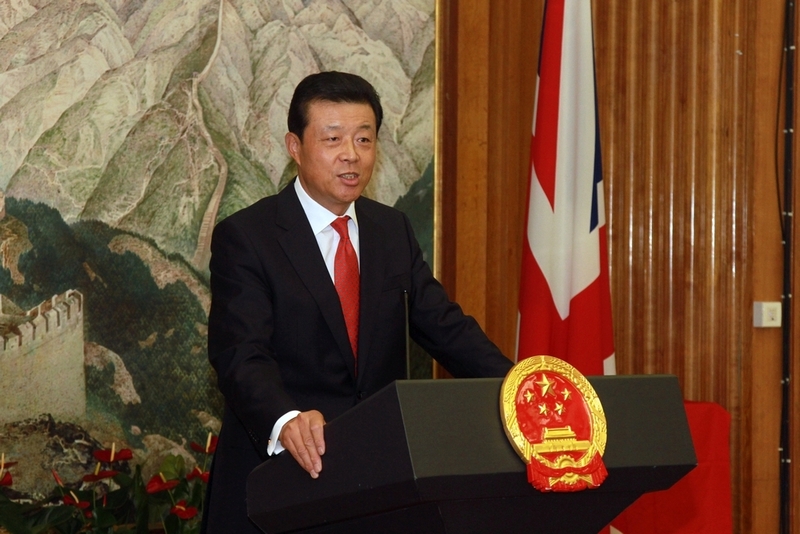 Ambassador Liu Xiaoming first delivered a warm speech. He said feelingly, “First, my warmest congratulations to you. You have lived up to the great expectations in the “homeland of Paralympics”. You won the first gold medal in the Paralympics and then keep creating the Paralympic and world records and leading the medal table by a large margin. So far you have won 194 total medals, including 75 gold, 64 silver and 55 bronze medals. This means that you have achieved the best results of the Chinese “Paralympic Corps” competing abroad in terms of both total and gold medals. Your amazing performance has not only encouraged the 1.3 billion Chinese people, but also won applause from the spectators on the spot and in front of televisions both in Britain and around the world. Even the always critical British media poured praises on you. The most common words they use to describe you are “remarkable”, “fantastic”, “most impressive”, “King of London” and “China’s moment”. Ambassador Liu said, “I also want to pay the highest tribute to you. From the "London Bowl" main stadium with 8 million spectators to the packed Aquatics Centre, and to all the competition venues with deafening cheers, the five-star red flag rise and the “March of the Volunteers” is played again and again. You have won new great honours for the motherland and people with your great achievements. You have demonstrated to hundreds of millions of the viewers your precious virtue of self-improvement and pursuit of excellence. You have shown to the world the spirit of the disabled people and the flourishing development of the undertakings for the disabled people in China. You have also embodied the hard-working and active styles of the Chinese nation today. We greatly admire your outstanding performance and we have a lot to learn from your hard-working spirit. With your inspiration we will bear in mind our missions, bravely face difficulties, forge ahead and make continuous progress in the diplomatic work. Finally Ambassador Liu expressed the sincerest good wishes to the delegation members. He said, “In two days the London Paralympic Games will come to an end, and you will return to the warm embrace of the motherland with great honours and start new journeys in your life. I hope that you will never forget the essence of Paralympics: transcendence, integration, courage and equality. I sincerely wish you optimism, courage and happiness in your future career and life, and I wish you continuous great life chapters. 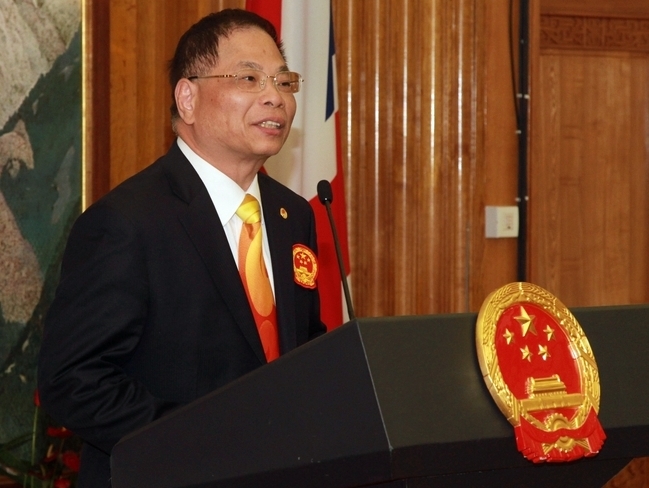 Delegation Head Wang Xinxian said in his speech that the inspiring remarks of Ambassador Liu was thought provoking. With great attention and care of the CPC Central Committee and the State Council and under the full support of the Chinese people, China sent a large sports delegation of 417 members to the Paralympics, among them 282 are athletes. Within just nine days in London Paralympic Games, the Chinese national anthem has been played for 75 times and the Chinese national flag has been raised for 194 times. It is hard to imagine any other occasion making the Chinese people so proud. When the old China attended the Olympics for the first time, only one athlete, Liu Changchun, traveled afar to United States for the competitions. But now such a formidable Chinese Paralympic delegation has achieved so impressive results. We have maintained our competitive edge in the arena with numerous strong competitors. This should be credited to the increasingly powerful motherland and the constant improvement in the overall strength of China since the reform and opening up. 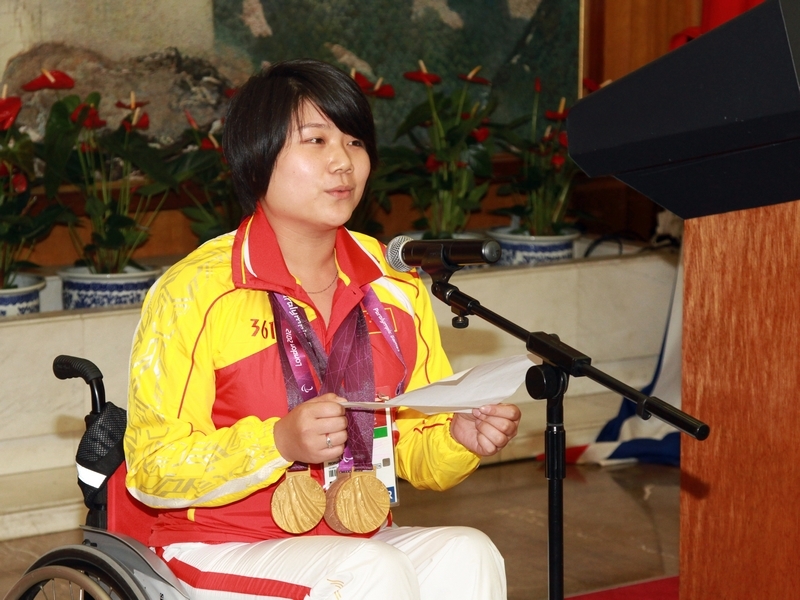 Wang Xinxian said that the Chinese Embassy has paid great attention to the work related to the Paralympics. 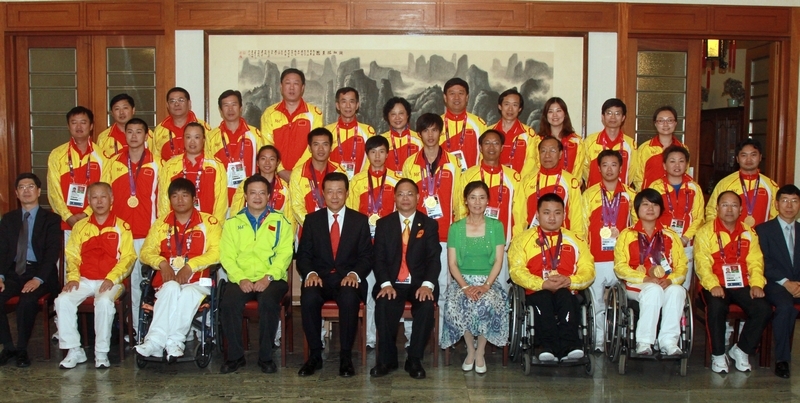 It has organized a strong team to provide considerate and warm services for the Chinese Paralympic delegation. From the opening of the London Olympic Games till now, everyone at the Chinese Embassy has been working hard without rest. All members of the Chinese Paralympic delegation express the heartfelt thanks and the highest respect to Ambassador Liu and all staff members of the Embassy. 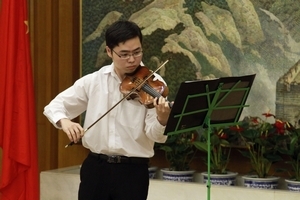 Wang Xinxian said that the disabled people in China are good at learning and courageous in striving. This spirit has become a precious wealth for the Chinese people. The Chinese Paralympic athletes will take today’s achievements as a greater driving force in their future work and study and create new honours for China and the Chinese people with their passion and talent. Zhang Cuiping, the first gold medalist of the Paralympics, delivered a touching speech on behalf of the athletes. She said, “with glory and dream, with pursuit and hope, we are here for the London competitions on behalf of our motherland. This makes us very excited and proud.” In the past 9 days, we met the athletes from different countries, made exchanges on our skills and enhanced our friendships. We can say without regret that we endeavoured, we struggled and we succeeded! When we are here for the competitions, we received good care of the Embassy and the enthusiastic encouragement of the local Chinese community. Though in Britain, we can still feel the warmth and caring of our motherland. Thank you. Thank our motherland. We will work harder and study modestly with an indomitable spirit to meet new challenges in the future work and life and make new contributions to our motherland and our people. Her words expressed the shared view of all the athletes in the Chinese delegation. After that, three Chinese art students studying in Britain presented to the Chinese Paralympic delegation their specially prepared performances. They expressed their heartfelt admiration and sincere solicitude to the Paralympic heroes with touching songs or sweet violin melodies. "Good Days", "Red Lily Blossoms", "Grateful Heart", "My Future is not a Dream", "I Love you, China" ...Every note of the cheerful, festive and touching songs have struck the heart chord of the audience and deeply infected every one of them. One overseas student said that just like the motto of the London Olympics, "inspire a generation”, the hard-working and indomitable spirit of the Chinese Paralympic athletes has inspired all the young people. They tell us that as long as we pursue bravely, our dreams will come true. This is exactly the true meaning of the Olympics and Paralympics. 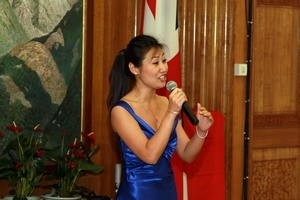 During the party and dinner, the hosts and guests gathered to talk about the “legend” of the Chinese Paralympic delegation in London Paralympic Games and celebrate the heroic exploit of the Paralympic athletes. Ambassador Liu and Madame Hu talked with every athlete and coach, listened to their stories and feelings and learned about their work and life. Towards the end of the dinner, Ambassador Liu found the latest answer to his “difficult question”: The Chinese Paralympic sports delegation won another 6 gold medals. With that the number of gold medals of the Chinese delegation soared to 81 and the total number of medals reached 204! Once Ambassador Liu announced this good news, the audience seethed with excitement. Every one we immersed in the joy and pride of victory. The patriotic passions collided, converged and sublimed in this beautiful evening.